These layered vinyl Harry Potter T-Shirts are easy to make with your Silhouette Cameo and the Designer Edition of the Silhouette Studio Software! These Harry Potter t-shirts are brought to you by ShirtSpace, but the content and opinions are that of Simply Made Fun. If there is one thing I will always regret it’s not making more Harry Potter t-shirts to wear to the midnight release of the books and movies. Back then making t-shirts meant using puffy paints and mad drawing skills and hoping and praying that your shirt came out looking somewhat like you pictured in your head. Mine never did, I’m a terrible artist. This is why I’m thankful for cutting machines. They make crafting easy and quick! Which is awesome and also a bit dangerous. My obsession with making t-shirts is maybe a little unhealthy. I love working with heat transfer vinyl (it’s so easy to weed!) and using my Cricut EasyPress makes cranking out shirts really fast. It also helps because there’s no guessing as to how long you need to press your designs for. There’s an easy guide on their website that tells you exactly how long you should press your designs depending on what material you’re pressing them on to. It literally takes the guess-work out of it for you! The only time you wouldn’t want to go by that guide is if you’re pressing multiple layers (like you would with the Ravenclaw shirt). For multiple layers you would press the first layer for 15-20 seconds and do each layer after that for only 5-10 seconds. But, we’ll talk more about why later…. Want to make sure your shirts look their best? Grab the HTV Placement and Sizing Guide! Let’s make our own layered vinyl Harry Potter T-Shirts! Learn how to easily layer multi-colored vinyl Harry Potter T-Shirts with the Silhouette Designer software! Download the RAVENCLAW design and load it into your software. To figure out what size design you should cut, reference the HTV Placement and Sizing Guide. Cut your design and weed it. Set it aside. Heat up your Cricut EasyPress and fold your shirt in half. Check this site for the correct settings for your EasyPress. Use your EasyPress to press the crease of your shirt. This is how you tell where the center line of your shirt is! Place the design on your shirt and put a teflon sheet on top of it. Use the EasyPress to press your design on the shirt. If you pull up the carrier sheet that is on top of your vinyl design and the vinyl pulls up with it, put the carrier and teflon sheet back on top of the vinyl and repress until the vinyl is fully pressed on the shirt. Are you doing a complicated layered design? Read more for tips on how to get it right (and not mess up like me)! The Silhouette Designer Edition really helps in multi-layer designs because you can cut by color or layer. 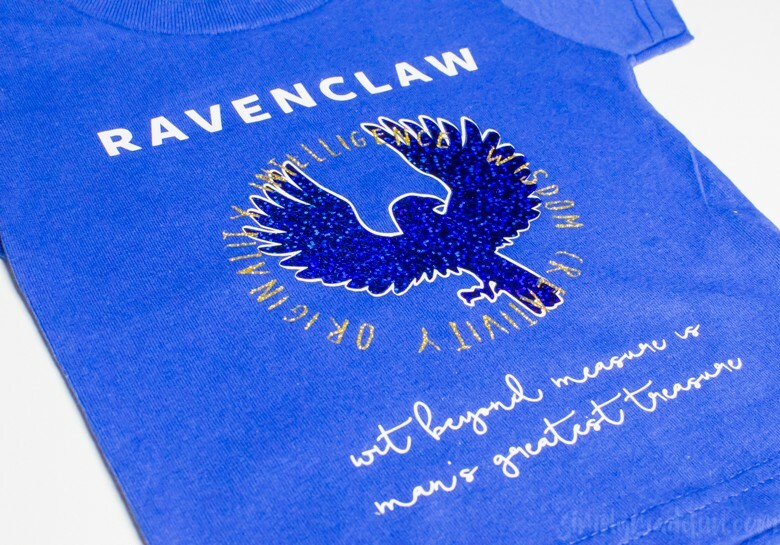 This made it really easy to cut my son’s Ravenclaw shirt because all I had to do was change out the vinyl on my cutting mat and hit cut. For the Ravenclaw and Luna shirts, this was the first time I had ever done a layered shirt and while there are small imperfections it wasn’t too bad. Always remember to GO SLOW when you’re cutting multi-layered designs. And also, move your iron/EasyPress to the side away from your shirt when you’re not using it. I say this because when I made the Luna shirt and accidentally put the hot iron on the already pressed vinyl when doing my second layer. It warped the vinyl and my shirt was ruined. I was bummed. Sometimes your vinyl will shrink if you’re pressing multiple layers but there is a way around this. Press the first layer for 15-20 seconds and then do every other layer for 5-10 seconds. If you overpress the vinyl it will cause shrinkage and your layers will look warped. Doing short presses will help stop it. If you need to remove vinyl because you messed up, DO NOT USE GOO GONE. I’ve tried and it just makes a huge mess. I don’t even know where that tip came from to be honest. It’s awful. I’ve used this vinyl remover on my Toy Story Squad Goals Shirt and it works amazingly well! It’s a must-have in my craft room. While I’m still bummed that my Luna shirt didn’t work out, layering vinyl ended up not being a scary thing to try. Once you get the hang of it it’s really easy and fun! Want to try more t-shirt designs? Check these out! More heat transfer vinyl crafts! Thank you Shirley! The Silhouette machine is so addicting and so fun to use. Thank you for entering the giveaway, there are some awesome prizes to win this year! 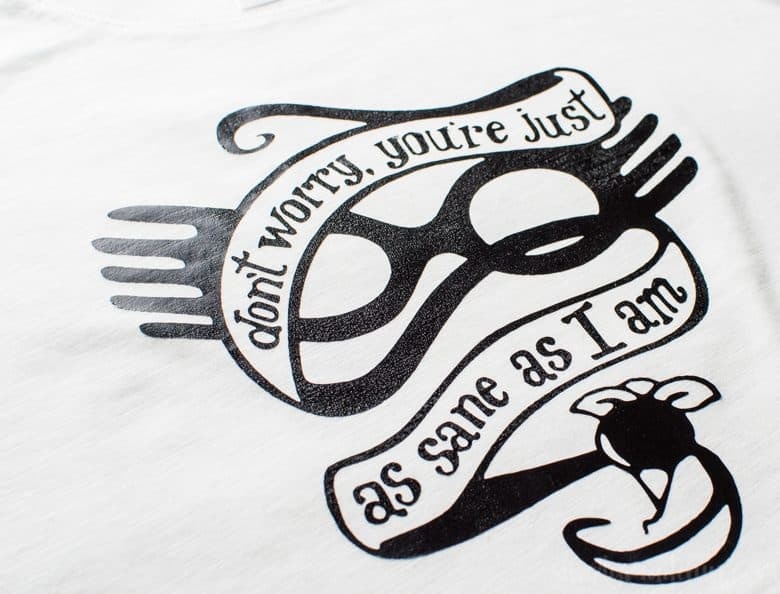 Ok – admitting I have not read Harry Potter (I know, gasp…), but love these tees! You make it look pretty easy to do, so I may try this DIY out! Wow your designs look so professional! Never would have guessed they were home made. Great job! Thank you so much Anna! They were a lot of fun to do! Cool designs! When I taught fifth grade, Harry Potter was all the rage. I know my students would have loved to wear these shirts to school! I love Harry Potter SO much. I am going to have to share this with all my HP friends. One of them just threw HP themed birthday party for her daughter and went all out. These would have made a great addition! My kids are just getting into Harry Potter! I love the Silhouette Machine and all it can do to make fun things like this! I absolutely love Harry Potter! I am trying to get my boys into it now. These are really cute. These turned out so good! I love the Happy Harry Potter series, I look forward to it every year! 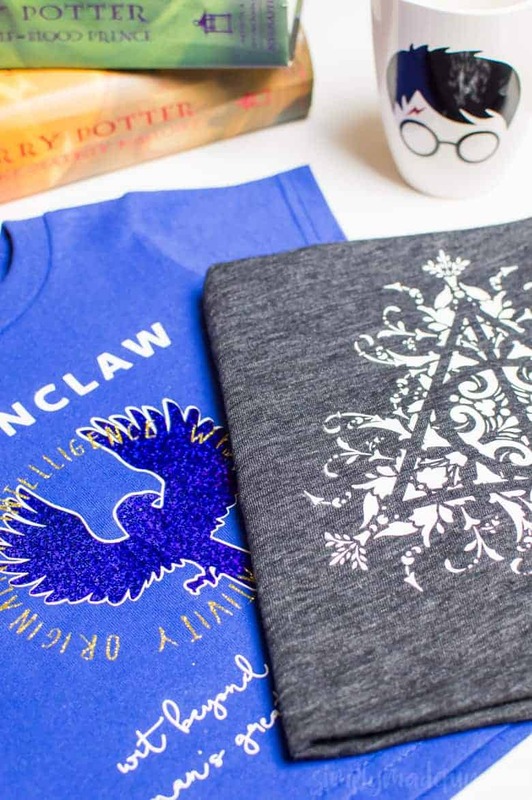 That Ravenclaw tshirt looks really cool. I can’t believe you made that yourself. I think my husband would like one of those. I can’t tell you how much of a Harry Potter nut I am… myself and my eldest son. We are soooo going to do this as a craft activity this summer. What an awesome prize pack. We’re a family of Harry Potter fans. How amazing are these designs and I love the idea of making your own prints! What a way to customize a shirt! Very original and definitely worth the effort. Thanks for the quick tutorial and that awesome giveaway! Wow, I am really impressed by the quality of these designs. I would totally purchase these in a retail store if I saw them for sale. After seeing this post, I think I need a Silhouette machine in my life. I would love to take T-shirt making to the next level. These look great! I’m a huge Harry Potter fan and love everything to do with it. These are so cute! I am a big HP fan and am so excited that there is another installment. It’s so funny, I own a Cricut and I still haven’t taken it out of the box. Can’t wait to use it and make something fun like this. These are adorable! I am sharing these with my readers too. I know so many families heading to HP World too. As a huge Harry Potter fan, I am in love with these designs! The quality is incredible. Wow! These are great! They seem pretty simple. My kids are a bit too young to be into Harry Potter but I will have to save this for when they are. Omg how awesome are these shirts!!!! Perfect for all the Harry Potter fans of the world! Well I love Harry Potter and this shirt is is freaking awesome. i can’t believe its not shop made it looks so professional! Love these shirts! I made shirts for the Twilight movies, yes I admit it, and it would have been much easier with my Silhouette! Just out of curiousity, where do you find your designs? I’m a new silhouette user and I’m looking for inexpensive/cheap designs. But I’m not sure where to start. Especially when it comes to finding HP images. Help! Hi Emily! I’m in a few Silhouette groups on Facebook, the main HP one being Accio Cameo and it is great! Silhouette Cameo Project Inspiration is another good one for all sorts of files! OMG that Deathly Hallows file….swoon. I NEED IT. any chance you’re willing to share where you got it/if you made it are you willing to sell the file?? Hi Regina! I got the file from a Silhouette facebook group called Accio Cameo! Hi, i love your posts they are great. Would you share or sell the deathly hallows design i would love to make one for my daughter. Hi Siobhan! Thank you so much. The Deathly Hallows file isn’t mine to share, but if you join the Accio Cameo fb group you’ll have access to it and other awesome HP files as well! Love it! Do you happen to have the cut design for the luna shirt? My daughter would LOVE it and we go to harry potter world in 2 weeks!! Thanks! Have fun at Harry Potter World! It’s amazing! Hi, the link to the Ravenclaw file isn’t working. It says ‘404 the file isn’t here anymore’. Is that one on the Accio Cameo fb group? i’m in that group, but couldn’t find this one. thanks! Hello! That is a file from the blog! I’m sorry the link is wrong. I’ll fix it later today and come back to comment so you can grab it. Thanks for letting me know! When I go to download the Ravenclaw file it says it’s not there, is there anyway to still download it?